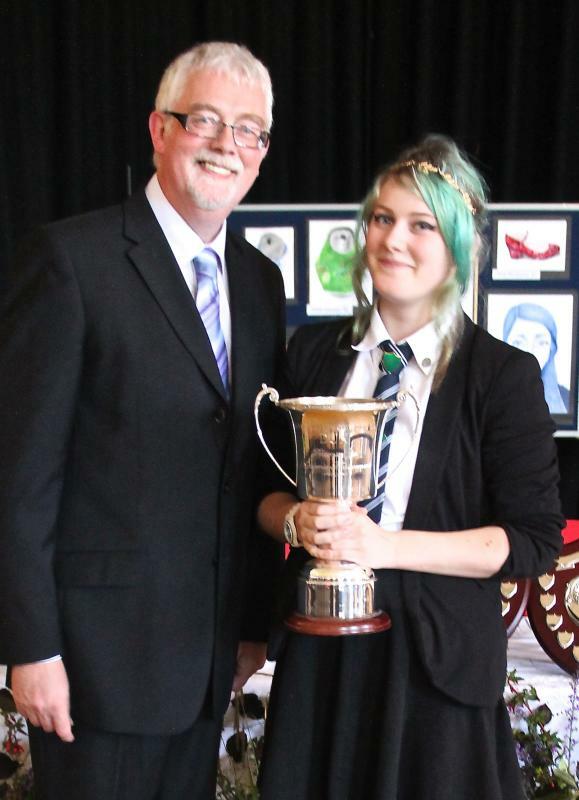 The annual celebration of the success and achievement of all pupils took place on Tuesday 1st July. Certificates of Perfect Attendance were awarded to Matthew MacKenzie, Anna Cameron, Eilidh Johnston, Deborah Connop, Charlotte Kelman, Joseph Smith and Innis Taylor. A number of pupils throughout S1 to S4 received Certificates of Personal Achievement for consistent effort and care in all of their work throughout the school over the whole of last session. Many pupils also received 5 by 50 certificates. Thanks to Revd Jeremy Ross for blessing the event. Thanks also to the Parent Council and the Hospitality staff and pupils for providing refreshments at the end of Prizegiving. Thanks to Mrs Brown and Miss Thistlethwaite for the flower arrangements in the Hall. Special thanks to Dr Caley without whose meticulous organisation this event would not run quite so smoothly. Deputies – Holly Morrison & Justin Claydon. The following senior pupils have been appointed to lead the three houses. Kerry House – Girls House Captain for this year is Ann MacLean. She will be assisted by Eilidh Owens. The Boys House Captain for this year will be Justin Claydon and Ciaran Alexander will assist him. Maree House – Girls House Captain for this year will be Siobhan Vickerstaff who will be assisted by Catherine Wyatt. The Boys House Captain will be Kenneth MacKenzie and Calum Street will assist him. Tollaidh House – Girls House Captain for this year is Holly Morrison who will be assisted by Sofie Banister. The Tollaidh Boys House Captain for this year is Jake MacDonald and Jordan Gorman will assist him. When other events and credits were taken into account the House Shield went to Kerry this year! Maree came second overall and Tollaidh third. Well done to Kerry although the Trophy for gaining most individual credits in the school was presented to Hannah Wood of Maree. YES/NO Referendum – Senior pupils organised presentations at assembly on Wednesday 2nd July with the help of Ms Velt. Two spoke on behalf of the YES vote for Scottish Independence and two spoke for Better Together. All pupils were encouraged to vote throughout the day. The result was very close with 56 voting NO and 51 voting YES. Mod Ionadail Inbhir Nis – Congratulations to Alasdair MacDonald and to Sandi MacLean who took part in the Inverness Provincial Mod on Friday 20th and Saturday 21st June. Alasdair won the age 13-u18 Accordion competition and Sandi won the age 13-u16 Traditional Singing competition. 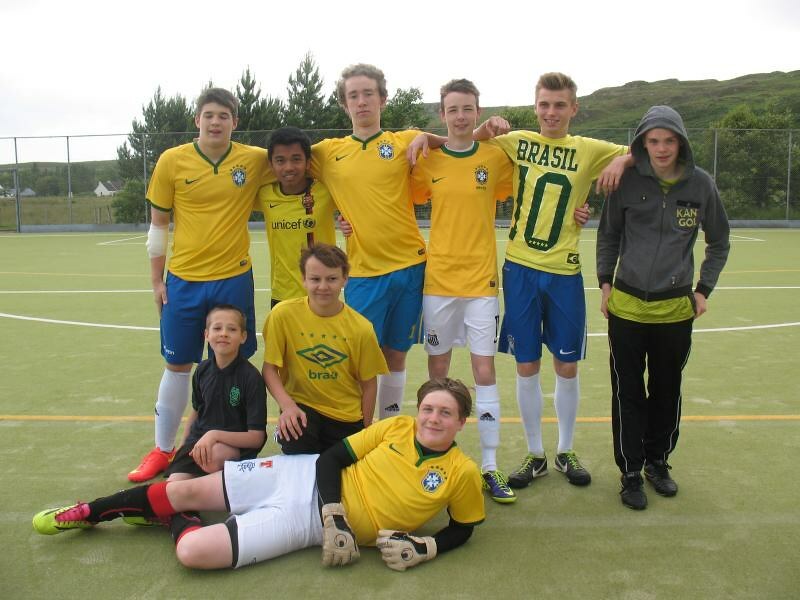 World Cup Football – Tournaments were held for boys and girls on the last day of term. 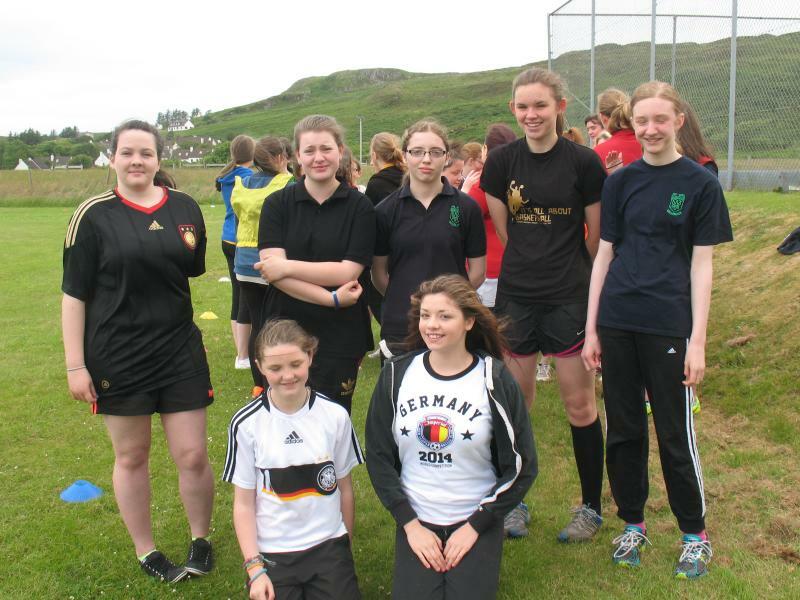 Over one hundred pupils took part with Brazil winning the boys’ competition and Germany winning the girls’ competition. The most influential players on the day were Connor Moore, Max Conway, Beth Townsend and Laura Russell. Thanks to all the staff who organised and helped in the running of the competition particularly. Staff Farewell – The staff and pupils bid farewell to Miss Dean. Since coming to Gairloch in 2006 Miss Dean has taught pupils Geography, climbing, outdoor education and taken part in many activities including the S1 residential weeks and mountain biking. Miss Dean has now left to take up a post at Dollar Academy and the whole school gave her a rousing send off at the final assembly on Thursday 4th July. Eilidh MacDonald and Carys Townsend presented Miss Dean at assembly with a map of the area signed by all the pupils and staff. Miss Smith will take her place teaching Geography after the holidays. Fundraising Donation – Many thanks to Julia Alexander for donating £1000 towards the Slattadale Renovation Fund. Julia’s work at the shop continues to benefit all groups and we greatly appreciate this contribution. Important Dates – Exam Results delivered to pupils by the postie from SQA on Tuesday 5th August. Pupils return to school on Tuesday 19th August. Have a good summer and the school news will return next term.